Yummy Chocolate Chip Cheesecake Dip will have friends asking for more! 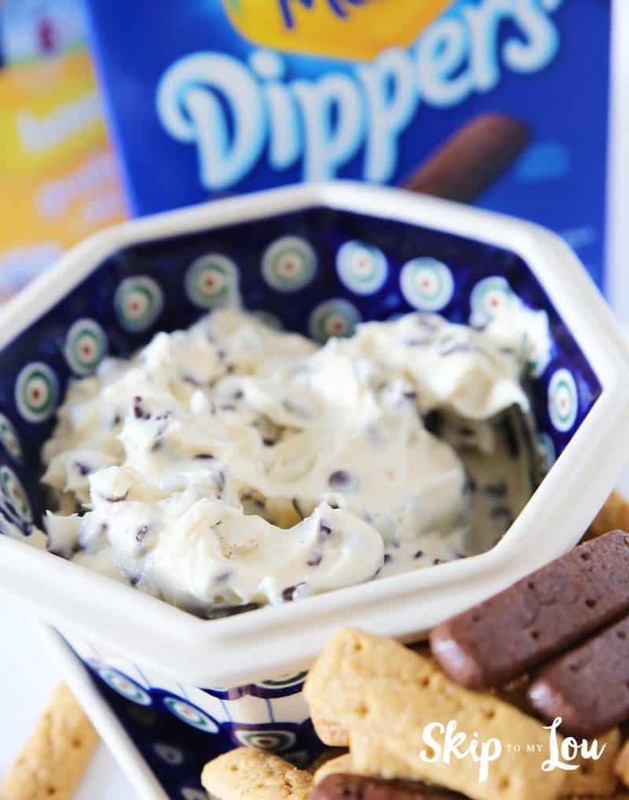 Home » Recipes » Chocolate Chip Cheesecake Dip will have friends asking for more! 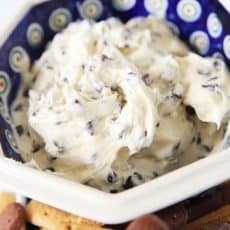 Chocolate Chip Cheesecake Dip will have friends asking for more! This Chocolate Chip Cheesecake Dip is simply divine. 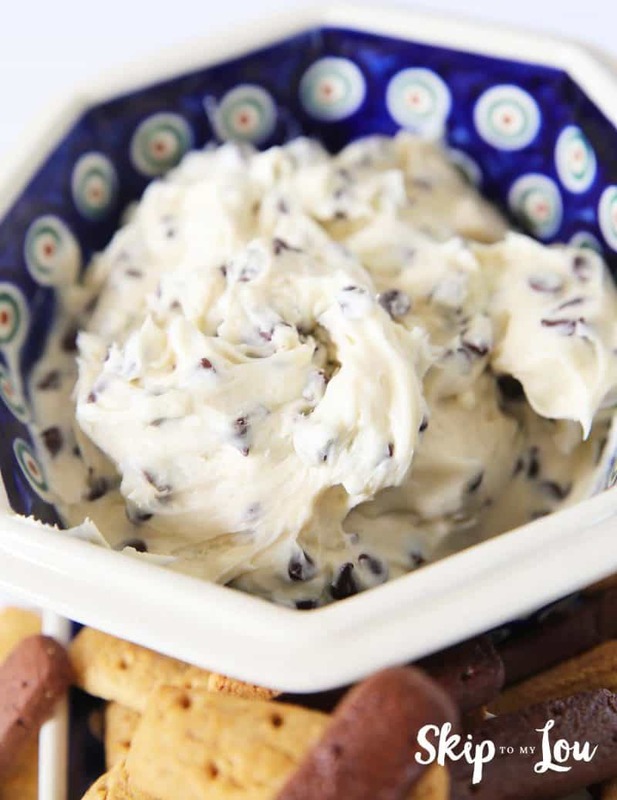 Just a few ingredients are needed to make this smooth and creamy chocolate chip dip. My friend Di did it again. She is always making yummy dips, and I guarantee this one will be a hit with your family and friends. You don’t want to miss her Monster Cookie Dough Dip recipe. It honestly is the best peanut butter chocolate chip cookie dough dip that I have ever tried. These are some of my favorite sweet dips! If you need to take a dip somewhere or are having people over, this chocolate chip cheeseball is always a hit. For sure it will be the first thing to go at a party. For a large gathering, you may want to double (or quadruple!) this recipe. It can be made ahead and refrigerated right in the serving bowl for easy party prep! A few ingredients make for a delicious chocolate chip dip! Mix together cream cheese, butter, powder sugar, vanilla and brown sugar with an electric mixer. Stir in chocolate chips. Serve with chocolate animal crackers or graham cracker sticks. Dips are a staple at parties, perfect for the “grazers” who stand the whole time. You know the type: These guests may not want to sit with a plate but put out some dip and crackers or chips and they will be all over it! At our house, we like to serve this chocolate chip dip with graham sticks, animal crackers or Teddy Grahams. If you like salty and sweet combinations, you might even try pretzel sticks. In the unlikely event that you have leftovers, this dip is delicious served with graham crackers—just spread a spoonful on like frosting. When you refrigerate the dip, it becomes stiffer. It then can be shaped into a ball. Roll it in chopped pecans or more mini chips and you have a chocolate chip cheesecake cheese ball. I just leave it in the bowl, where it will quickly soften. To serve, surround dip with an assortment of animal cookies and graham cracker sticks. How about some strawberries on the side for a pretty and fresh accent? It’s hard to go wrong—in fact, I think my kids would eat it with a spoon if I let them! Just watch this video to see how easy it is to make cheesecake dip! Whether it’s a holiday party or a lazy Saturday night in, you really can’t go wrong with cheesecake. If you love cheesecake as we do, please try some of our other favorite cheesecake recipes. We’ve got everything from simple classics to new twists! Instant Pot Key Lime Cheesecake – Heavenly dessert made in a pressure cooker! Pumpkin Cheesecake – This recipe is easy as pie! Teddy Grahams are a great idea Cassandra! I like the Oreo and chocolate chip cookies from the 100 calorie individual bags. They're the perfect size for dipping. I've made this dip for years and it's wonderful! I made this for a potluck at work today...huge success! Well other than it was the first food to run out and people wanted more. Gosh Maggie I don't know. What if you figured two tablespoons per person as serving size. I bet it would be easy to figure out how many tablespoons in the cream cheese and chocolate chips and make an estimate. I think my coworker makes this! It's so good!! I make this all the time. It tastes great with the mini vanilla wafers or, if you can find them, the chocolate graham cracker sticks. This sounds amazing. Great for a treat at the end of parties. Looking for great halloween ideas easy and fun! Would be a great spread on bagels. Will have to try it.....take to work. Sounds and looks delicious!!!! My mom makes something similar but she uses almond extract. I'm never heard of using chocolate chips in it sounds like a good idea. There is all kinds of things you can dip in it. Strawberries, raspberries, cherries and other fruits, and as they mentioned using graham crackers. I'm sure you could use sugar cookie pieces and or plain animal cookies. @laura m - You could dip graham crackers! Mmmmm! Can you substitute Jello sugar free cream cheese pudding instead of the cream cheese? It sounds like it would be good with graham crackers. Yummy! I will try it at our next church dinner-on-the-grounds. For my nephew's 1st birthday party, they served this as cookie dough dip. ( cookie monster party) Graham crackers were the dipper.very yummy! THIS is the recipe I will try and take to our next choir rehearsal snack bar! Last night someone brought a cake batter dip served with graham crackers and everyone was raving over it (95 members!). I think this one will having everyone singing soprano too! Thanks for sharing!